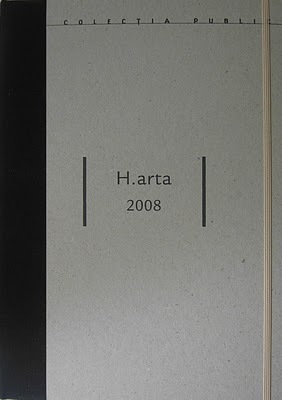 2008 (published by IDEA Publishing House Cluj and Walther Konig Koln, edited by Marius Babias and Sabine Hentsch in 2007) is a weekly diary, a practical object that people can use in their everyday life and which contains, in relation to some days of the year, texts and images commenting an event from the Romanian recent history, events that are showing the histories of the excluded and marginal ones, events that are showing the injustices of the dominant but that are also showing examples of resistance to the dominant. The notebook that has a limited time to be used (the period of one year) is a signal for the fact that history needs to be constantly rewritten. Also, the fact that the book is a practical object that you can use daily, your own handwriting intermingling and overlapping with the historical facts is some sort of constant demonstration that history is always here, shaping the present.